A planned £1.8m "innovative" development will "inject fresh life" into Jurby, the government has said. The three-year scheme, aimed at attracting business and creating "a community hub", will begin with four new units at Jurby Business Park. 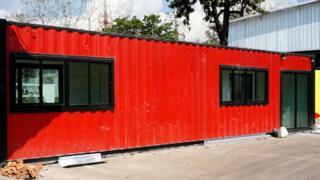 The wider plan includes refurbishing shipping containers as business units and building three bungalows. The Department of Infrastructure (DOI) said the aim was to "create more of a buzz" in the area. A DOI spokeswoman said the plan to grow industry and businesses would help "grow the economic activity and therefore the reason to live here as well". Jurby and Northern Communities Initiative member Angela Quaggan said the area was "underutilised" and the first phase of the project could be a "trigger" for people moving to the parish. She added that if it was "handled sensitively", it would be "a positive thing". Funding for the scheme was approved by Tynwald in the 2019-20 budget. If planning for the project is approved, work on the first phase of the development would start later in the year.